One Person. One Act of Kindness. One Step Closer! Here is something that we hear often: people believe they cannot do anything to help animals because they are not currently able to adopt. We understand that not everyone is able to add another permanent pet to their family, but adoption is not the only way to make a difference for animals. In fact, there are little things you can do every single day to make our community a better place for animals and to help us achieve our goal of becoming a No Kill community. You are one person among many, and all of our collective actions will be what ultimately saves lives in our community. Just try it and see! Check out this great list of life-changing (and life-saving) ideas, compiled with the help of No Kill Louisville members just like you! What is the "Just One Thing" that YOU will do today to make a difference for animals? Tell at least 10 people about the No Kill movement. Spreading the word is crucial! Do some spring cleaning and donate unused pet items, towels and blankets to a shelter or rescue or local businesses! Foster a dog or cat! Time commitments vary, but this is a phenomenal help! Adoption is a great option! Be sure to tell people that! When people admiringly ask what kind of dog you have, tell them a shelter or rescue dog! Or tell them that there are others just like yours waiting to be adopted. Donate pet food or pet supply coupons to shelters, rescues, or pet food banks. Or, use the coupon yourself and then donate the food or supplies straight to the organization! Arm yourself with information. Know about the different local animal organizations and all that they offer. When you talk to someone who needs help with a pet, you'll be able to send them in the right direction. Talk to local pet stores about donating slightly damaged merchandise to a shelter or rescue group. Talk to hotel managers about getting old blankets donated to a shelter or rescue group to keep all the animals comfortable. When you or someone you know is considering giving up their pet, come up with solutions that would keep the pet in the home. Pet food banks, training classes, and pet-friendly housing are just a few examples of ways to keep a family together. Help lost pets return home. Even something as simple as browsing various lost & found listings to look for matches can make a difference! Reach out to the seniors in your life (or to a senior center, etc.) and help them find an older canine or feline companion to keep their lap warm, their hands busy, and their hearts happy! Students can create school groups focused on aiding shelter/rescue animals. 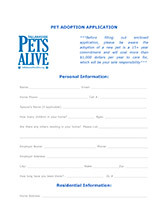 The preceding was re-printed with permission from No Kill Louisville. 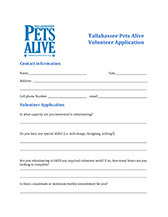 Get Involved with Florida Pets Alive! 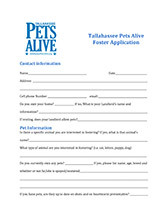 Florida Pets Alive is looking for volunteers to help us spread our message. Do you have a special skill or talent? We need it all! If you are interested in making a difference and volunteering with us check out our Volunteer Opporunities, and fill out a Volunteer Application.